My Golf doesn’t have them ex-factory. And they’ve not (yet) been added. But if I were to add them, the “user interface” would be different to the conventional push-button one which has changed little since the first power windows in the 1940’s. 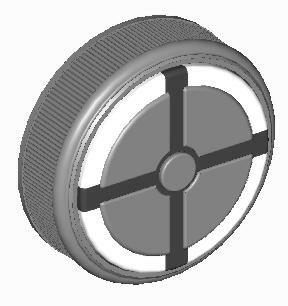 The opening of the window is to be controlled by a rotary knob which can be turned to wind the window up or down; similar to a mechanical winder, but without a crank handle, just a large round knob (approx 50mm diameter and 15mm “wide”) . Turn the knob slowly one way and the window “follows” up or down, depending on the direction that the knob is being turned until the window is either fully open or closed. Spin (flick) the knob quickly either way and the window moves as quickly as possible in the corresponding direction to open/close. Here’s a rendering of what the master control knob on the driver’s door could look like. The main advantage and distinction is that the slow turn of the knob controls how far the window moves. Although this may be construed as an inventive step by some, it merely mimics the action of the mechanical winder. The outer ring rotates, leaving the hub stationary. There are 4 outer pads on the hub, one corresponding to each window and a central button. Each of the 4 outer pads has an indicator LED to indicate which window is selected. This arrangement provides for any combination of 1, 2, 3 or 4 windows to be controlled selectively by the driver. if one of the outer pads is pressed, then that window is selected. If two of the outer pads are pressed simultaneously, then the corresponding windows are selected. Pressing the centre button selects all windows. Pressing the centre button, holding it and pressing one of the outer pads selects the 3 other windows. The LED for any selected window blinks as the window moves up or down as a feedback from the stepper motor moving the glass. Additiona feedback can be provided by using a weak stepper motor as the encoder on the rotary control knobs. A small excitation current (even shorting the windings) provides tactile, “cogging” feedback of increased magnitude. The flick to open and close a window can be emphasised by keeping knob set to control that window turning; as long as the window moves. If the motor is “overloaded” by the operator stopping any controlling knob from turning, the window can be stopped immediately. [2011-11-28] Simplest implementation would be by stepping motor with outer rotor integrated into the ring of the knob, allowing for a large-diameter hollow spindle through the stator to mount the control surface at the front and to route its wires. A modified button-pressing sequence on the master such as pressing and holding the pads for a second, can be used to block other window controls with a LED of a different colour to indicate which windows’ controls are being over-ridden. As cars tend to experience vibrations for a number of reasons, the control knob may signal spurious pulses which could lead to undesired window movement. This can be prevented to some extent by requiring several pulses in the same direction to be registered after some “dead time”, before recognizing the input as a legitimate command. e.g. require 3 pulses in the same direction if the window hasn’t been moved for 30 seconds before responding. There is of course no need to put the control knob on the door with a networked car. It could be anywhere that’s convenient. Or indeed the need to provide a control at each door. The minimum configuration is just the one master control placed on the centre console. Next step up is to provide window controls to the rear seat occupants with a central one on a bracket above their heads, on the headliner. That knob would need a hub with two pads for left and right windows. The reason for the high placement is to be in reach for a restrained occupant; and automatically out of reach of small children.